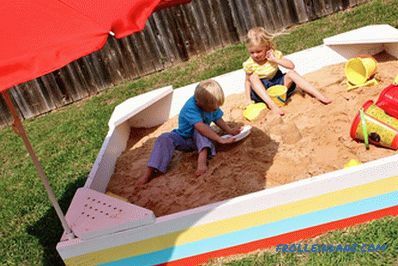 Children's sandbox with their own hands? There is nothing easier. I'll tell you how this small source of great joy appeared next to our house. Once on Saturday, my wife told me: "We are making a sandbox for children!" Well. Good. 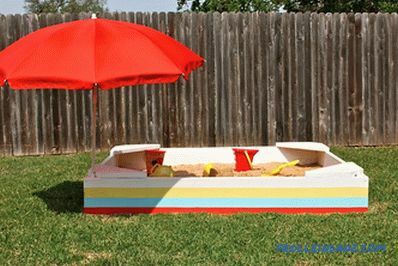 A simple, brightly colored sandbox with benches for seats with holes so that sand does not accumulate on them, two places for attaching a beach umbrella and, of course, lots and lots of sand. Oh yes, and two happy children. 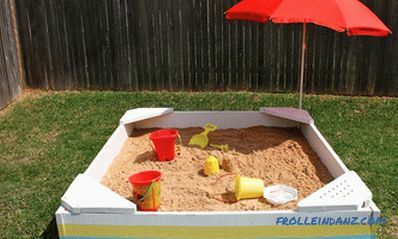 Do you also want to make a sandbox for your children? Actually it is quite easy. The process of building a sandbox is somewhat similar to creating a flower bed. We are not carpenters. 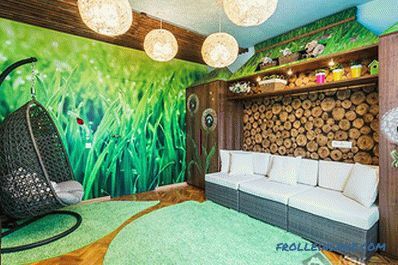 If you are a specialist in woodworking, you can certainly give the best advice on the concept of design and the right choice of materials. I will show you what we have done, possessing only basic skills in the field of repair and construction. And they will accompany my step-by-step instructions for building a sandbox for children with their own hands, numerous photos, one glance at which will be enough to understand how and what to do. 1. 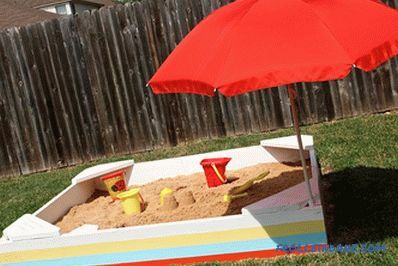 The sandbox is a 180 by 210 cm rectangle. 2. The bottom is made of wooden planks that interlock with each other. 3. From the scraps of the boards, we made seating places in 4 corners (ideal for mom and dad). 4. In the two corners we placed pieces of PVC pipe to secure the parasol. 5. You can additionally make a cover for the sandbox. We in our area have never had problems with stray cats that would use the sandbox as a toilet, but for many people this issue is relevant. 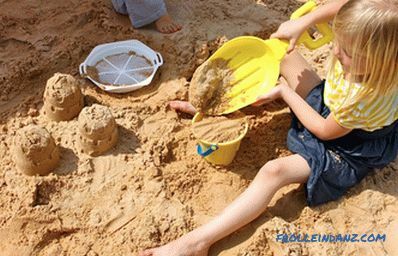 Choose a place in your yard suitable for the sandbox. We preferred the flat ground in the corner of the yard, near the fence. Prepare the plot, clean it from the sod. 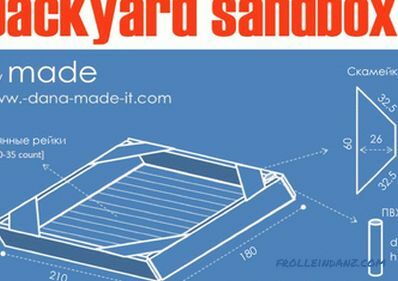 Decide on the design and size of the sandbox. Purchase the necessary materials. We bought long 3-meter boards (about 2. 5-3 cm thick). Trim boards were used to create benches. 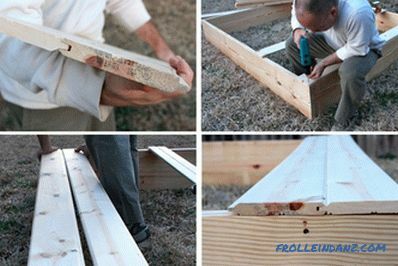 Saw off the fragments of the boards necessary to create the length of the sandbox frame. Use a hacksaw or a circular saw for this. Do not forget about goggles! 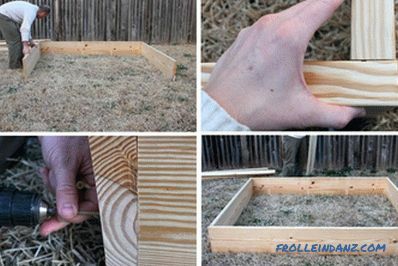 Build a sandbox frame. It is not difficult at all ... just assemble a rectangular frame 180 x 210 cm from the sawed-off fragments and fasten the boards with nails or screws. Make the bottom of the sandbox. Note: The bottom is not an indispensable element of the sandbox, but without it your building can loosen and deform over time. In addition, weeds can grow inside the box. On the other hand, the bottom quickly comes into disrepair under the influence of atmospheric moisture, since the floor often gets wet in the rain and there is almost no chance of it completely dry. After weighing all the pros and cons, we decided in favor of installing the bottom of the sandbox. 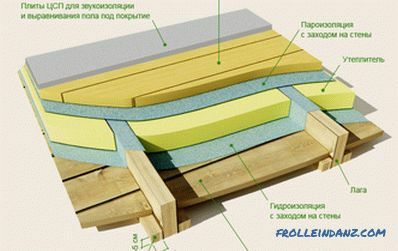 To create the bottom, we used clapboard - wooden boards that are interlocked with each other. 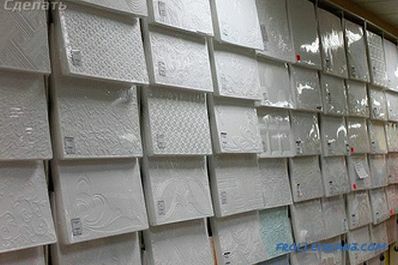 They are more expensive than usual, but working with them is much more convenient. 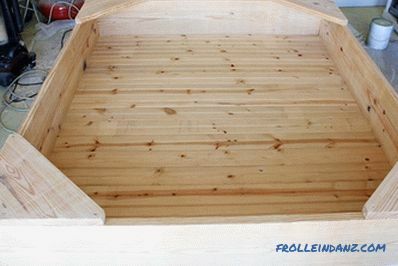 The frame and the bottom are ready, you can start creating benches! They not only serve for sitting and rest, but also give additional strength to the frame. Take trimming boards and cut the fragments, marking up directly on the spot (in the corners of the frame). Do not forget to grind rough edges and surfaces. 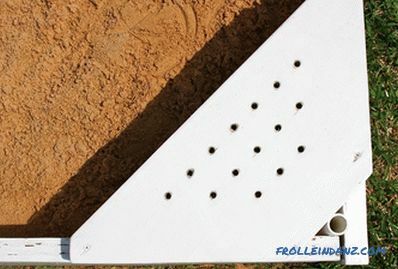 You can drill several holes in the bottom to allow rainwater to drain. How much this is needed is a controversial issue. 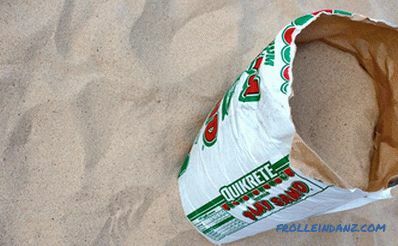 But we think that it will still be useful: at least part of the water trapped in the sand will be absorbed into the ground. Well, well, you did a good job. 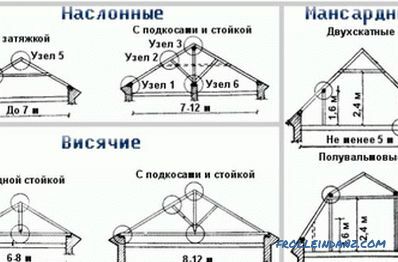 As a result, you should have a construction similar to the one you see in the photo. Note: we took this photo in the garage, where we brought in our unfinished sandbox, saving it from the rain. We planned to cover the wooden surfaces with a layer of sealant, but later, after some thought, we decided that this was not necessary. 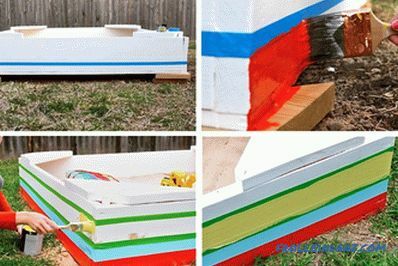 Paint itself is the best way to protect wooden garden buildings. One final touch. .. Fix short pieces of PVC-pipe in the corners into which you can later insert a beach umbrella to protect against the scorching sun. It was my wife's idea, and I think she is brilliant. We drilled a hole in the bottom of the sandbox to accommodate the pipe.She stood firmly in the corner between the bench and the side of the sandbox. If your beach umbrella is bigger than ours, you will need a larger pipe. And now I’ll go on to the really exciting part of the work ... Painting. 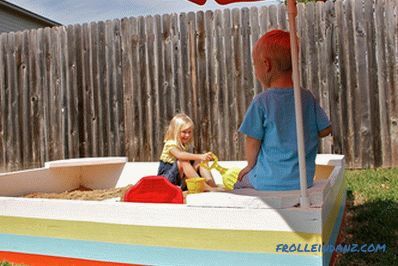 For the sandbox, I chose the colors in which our house is painted - red, yellow and blue. 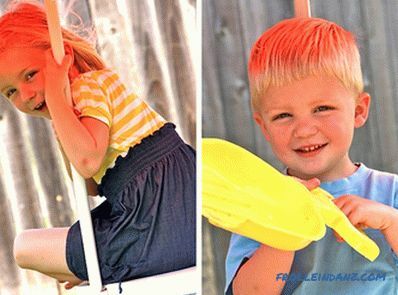 To begin with, paint the inner walls of the sandbox with white paint. 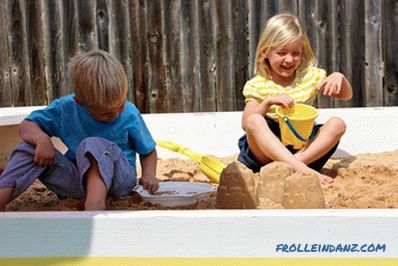 Before painting the sandbox outside, lift it up with the planks propped up. 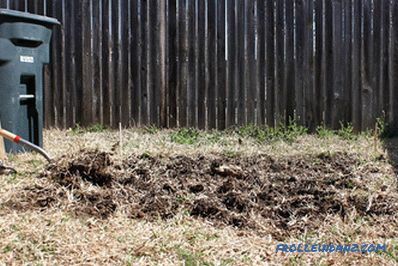 If you don’t do this, the brush will quickly dry out in the ground, and the result of your work will not look so neat. 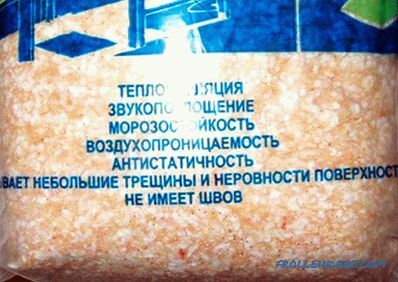 But do not lift the sandbox when painting it from the inside, as you will have to stand inside the box! 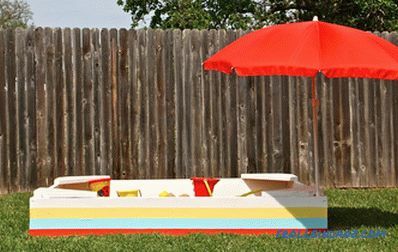 Paint the benches and the outer walls of the sandbox with white paint. 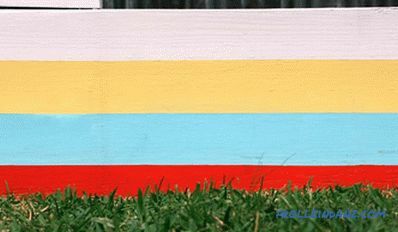 Decide how many color bars you want to make along the outer perimeter of the box, and calculate their width. Use masking tape so that the borders of the bands are even and neat. Start painting from the lower band. Let the paint dry for 6-8 hours, then remove the adhesive tape. 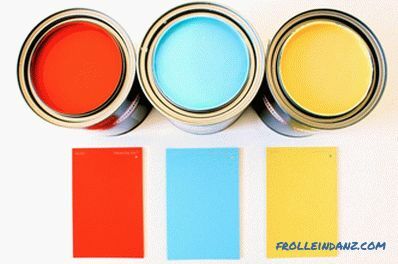 In the same way, paint over a strip of a second color, then a third one, and so on (we recommend leaving the top strip of white). And finally, when the paint is dry, pour in the sand. To create a good volume you need 20-30 bags. 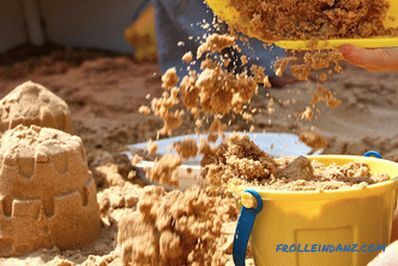 But no matter how much sand you sleep, you and your children are guaranteed a lot of pleasure ... especially when it gets wet to the consistency that is ideal for building sand castles. Enjoy! Rejoice, looking at your happy children and realizing that you have done this sandbox yourself!